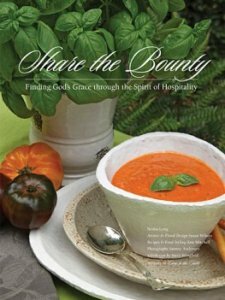 Share the Bounty: Finding God's Grace Through the Spirit of Hospitality by Benita Long is a cookbook from the creators of Come to the Table. This is the first cookbook that I have reviewed on the blog and was looking forward to seeing how the author would incorporate the concept of hospitality in a cookbook. The Bible references to the concept of hospitality many times. What a neat concept of a book, I thought to myself, a book chock full of tasty recipes packed with Biblical references to hospitality. Well, when I first received the book I must say I was impressed with the photos and the recipes! Also, it is a hardcover and quite large, around 8"x10" I would say. A perfect size to add to your collection or a wonderful gift. The recipes are inviting. "Fireside Soup" is one that I tried immediately and loved! A good hearty soup with sausage, beans, and the works. I would definitely feed this to guests! What I was not so fond of with this cookbook were the quotations found throughout. Sure the Bible was quoted and so were church history leaders such as Martin Luther. I also did enjoy the quotes from people like Helen Keller and Mother Theresa, but then there were some odd quotes from secular musicians. Yoko Ono? Led Zeppelin! And others. I am not the type of person that believes you need to become like the world to win the world. Jesus is who He is and that in itself is powerful enough.